Yesterday, peaceful demonstrations in the centre of Chişinău, Moldova degenerated into violent clashes between protesters and police. This was a response to the result of Sunday's parliamentarian elections which resulted in a striking victory for the Party of Communists. After processing 97.93 percent of the votes, the Central Electoral Commission presented the list of parties that will enter the future Moldovan Parliament: the Party of Communists with 49.96 percent, the Liberal Party with 12.79 percent, the Liberal Democratic Party of Moldova with 12.26 percent and the Alliance Our Moldova with 9.81 percent. If confirmed, this percentage would allow the communists to elect the president and form the government. On Monday evening, a group of students and youth spontaneously organized a peaceful march of protest, which they regarded as an act of national mourning, in the centre of the Moldovan capital. The youth showed their disagreement with the results of Sunday's elections, which they considered to be incorrect. They said that the actions would continue. On the following day, Tuesday 7 April, a demonstration drawing even more people began at 10:00 a.m. in the Great National Assembly Square which is in front of the Government building in the centre of Chişinău. After some time, the protesters divided into two groups. One remained in the square while the other marched towards the Presidential and Parliamentary buildings which stand across from each other on the same central artery only a few hundred meters from the Great National Assembly Square. The main state institutions - the presidency and the parliament - were devastated by thousands of youth. The crowd took the buildings by force. They first started to throw eggs, flowers and bottles at the presidential building. The police reacted by launching loads of teargas, but had to retreat when the people started throwing stones, taken from the pavement before the institution, at them. The youth broke through the police blockade entering the building and threw personal items of Vladimir Voronin (the President of Moldova and first secretary of the Party of Communists), including pictures and documents, out of the window of his office. They managed to reach the top of the building and unfurl the flags of the European Union and Romania. Afterwards, they turned to the Parliament and took it by force as well. The police tried to attack several times, but the crowd resisted the attacks and broke through, forcing the police to retreat. The youth penetrated the building and destroyed the building's first floor offices. They threw computers, a printer, furniture and documents out of the windows and burned them in front of the building. The situation got out of control near the perimeter of the Presidential and Parliamentary buildings while, in the Great National Assembly Square, the representatives of the opposition were peacefully protesting the 5 April vote and pleaded for the organization of early elections. They repeatedly urged the crowd not to resort to violence and to continue their protest peacefully. Around 30 thousand people participated in Tuesday's demonstrations. More than 100 persons, both protesters and police, suffered injuries. Another 200 protesters were arrested that night. In the meantime, there was little information available in the province about what was happening in the Moldovan capital. Almost all Moldovan news portals broadcasting live from the centre of Chişinău were blocked. The public television and radio stations, which are controlled by the current government, said nothing about the protest, broadcasting instead movies and music. Private televisions were disconnected from power and mobile communication from the protest area was jammed. Information and video from the protest was diffused online, on the Internet, on blogs, and by way of Twitter, Youtube and Facebook. The informational blockade continued on Wednesday with very slow or no connection for the sites with the .ro (the Internet country code for Romania) extension which offered information about events in the Republic of Moldova. Vladimir Voronin: "This is a coup d'etat"
Vladimir Voronin, the president of the Republic of Moldova, addressed a message to the citizens of the republic in the evening of 7 April on public television channel Moldova 1. He qualified the protests from the centre of the capital as a coup d'etat attempt and brought direct accusations against the leaders of the three opposition parties that entered the parliament in Sunday's elections. "This morning, Vlad Filat, Mihai Ghimpu and Serafim Urechean have practically become the leaders of the headquarters that organized an anti-constitutional coup d'etat in the Republic of Moldova. All they have done in the last days - the takeover of the presidential administration building, the assault of the Parliament, the violation of the Moldovan flag - can not be qualified as anything other than an attempted coup d'etat," Voronin said. 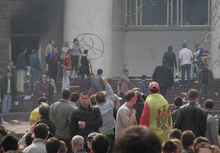 He added that the aims of the protesters were obvious: the liquidation of the Moldovan state and democracy. The president launched his message after a meeting in the afternoon of the same day of the leaders of the four election-winning parties. He regarded the negotiations as a failure because the leaders of the opposition denied responsibility for what happened in the centre of the capital. Marian Lupu, the speaker of the current Parliament, partially recognized that the violent actions were not organized by the opposition. He made this declaration after negotiations with the leaders of the Liberal Party, Liberal Democratic Party and Alliance Our Moldova on the afternoon of 7 April. The three opposition leaders asked the crowd in front of the Government building to protest peacefully and made attempts to bring the protesters standing at the Parliamentary and Presidential buildings back to the Great National Assembly Square. Dorin Chirtoacă, the mayor of Chisinau and vice-president of the Liberal Party, declared that he had expected the authorities not to link the opposition with the violent actions, which, in his opinion were lead by provocateurs, and asked for a public denial of the accusations launched by the communist leaders. He asked for the right of the citizens to freely express their disenchantment with the result of the elections. Vlad Filat, president of the Liberal Democrat Party, said that the communist authorities promised that the opposition parties will dispose of all the minutes from the voting sections. This might give the opposition an opportunity to detect electoral fraud and ask for anticipate elections.